When it comes to shopping for a new vehicle there are a ton of decisions to make, the most important being which vehicle you want to purchase. Before getting to that decision, though, there are a bunch of smaller decisions to be made. What kind of vehicle do you want? What size? What brand? What model? And so on. We’re here to help you narrow down your decision, specifically to help you figure out what brand you might be interested in. We’ve created several pages like this one, filled with information regarding the different brands we often carry here at Godwin Motors. Today we’ll focus on the used GMC vehicle in Columbia SC. If you’re leaning towards utility vehicles or pickup trucks, then GMC might be the brand for you. They don’t build any sedans, coupes or the like, so if that’s what you’re interested in then GMC probably isn’t a good fit. The brand does build higher end crossovers, SUVs and pickup trucks in a multitude of different sizes. 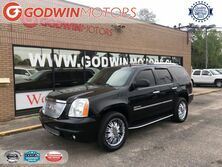 Each of their vehicles are offered in premium trim levels called Denali as well, which represents the epitome of luxury from the General Motors brand, perhaps only rivaled by some Cadillac crossovers. If you’re shopping for a truck, they offer the midsize GMC Canyon or the larger Sierra models, available most often in 1500, 2500HD or 3500HD. When it comes to crossovers you can get the compact Terrain or the midsize Acadia, plus they’re also one of the few brands to still offer a traditional sport utility vehicle: the GMC Yukon. Finally, the GMC Savana is a work van that might occasionally pass through our inventory. Older models that are no longer made include the midsize Envoy SUV and compact Sonoma pickup truck. These are rare models that were discontinued in the ‘00s, but it’s possible you might find one. If GMC sounds like a brand you might be interested in, be sure to check out our inventory and see if there’s anything that piques your interest. We can’t wait to help you find your next vehicle!